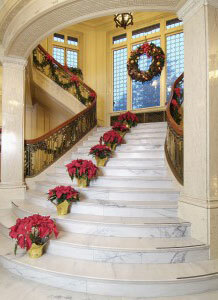 The Magic of Wintertime is the theme of the Pittock Mansion‘s annual holiday exhibit. Except for Thanksgiving day and Christmas day, the holiday display is open every day from 23 November through 2 January 2016. Admission is free for members, $11 for adults, $10 for seniors (65+), $8 for youth (ages 6 – 18), and free for children ages 5 and younger. Parking is limited at the mansion, so take a shuttle from the Washington Park parking lot – save $1 on admission and get reimbursed $4 for parking for your effort! Or just take transit to to Washington Park to save the entire cost of parking.